My neighbor Roxanne called to thank me for “the magic beans.” I was surprised; how did she know I called them magic beans? I hadn’t mentioned the beans at all when I’d handed her husband a brown bag that also contained cucumbers and tomatoes from the garden. This was high praise from the wife of a man who grew green beans for 85 or so of his 90-some years, though he doesn’t grow them anymore, now that he is permanently bent in a planting posture. I agreed with Roxanne that these beans were the best, and then I explained why I call them magic beans. I’d learned about these beans from my friend Teresa Barrenechea, when I was editing her book [%amazonProductLink "The Basque Table" asin=1558323279]. In Spain, Teresa had explained, the typical green beans weren’t tubular but flat, and much, much tastier than the round kind. Ah, the Spanish grow Romanos, I had thought. I disliked Romanos because they were always in such a hurry to swell, and their seeds, to me, had an unpleasant beany flavor. But the Spanish beans, as Teresa described them, had no such faults. A few years later, in 2001, I was traveling in Spain with my son Ben, who had just spent a year as an exchange student in Galicia. While walking in a public garden we came upon a small model vegetable plot with a few bush-bean plants. Spying a dry pod, I pocketed it, slipped out the seeds, and dropped the empty pod to the ground. But on the day when Ben and I were preparing to leave Spain, I panicked. What if the agricultural police caught me with the bean seeds? What if they didn’t catch me, and my five seeds introduced some phylloxera-style bean pest into North America? I decided to leave the beans in the wastebasket of the pension. The following spring I planted three of the seeds, but too late; early rains rotted most of the pods before they reached maturity, and I harvested only five more good seeds. More or less the same thing happened for the next several years, and some years I had nothing to plant but reserved two-year-old seed. But slowly I built my stock, and in 2008 I had enough to plant two long rows. We started eating the beans. Teresa was right, we discovered. They were delicious, meaty, and stringless with a flavor at once both rich and mild, “lacking the nasty part of the bean flavor profile,” as my husband put it. Unlike Romanos, the pods grew to full size and rested a bit before swelling and toughening. Can you grow beans like these? Spain has numerous varieties of flat, stringless judías, or green beans, of both pole and bush types. 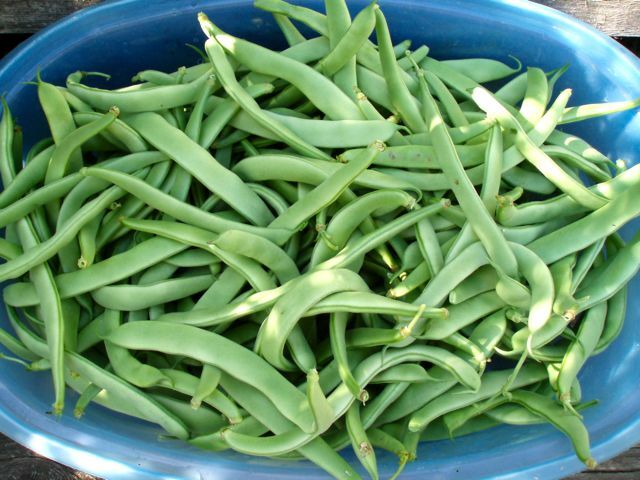 Renee’s Garden sells a Spanish variety that sounds very similar to mine, under the name Musica, but it is a pole bean. As far as I can find, no Spanish bush variety has been imported to the United States. Many American seed companies are selling a flat bean called Roma II, which looks similar to my bean, though shorter and broader, but I haven’t tried it. Other flat varieties pictured in the Vermont Bean seed catalog look lumpy, swollen with bean seeds, rather than sleek like mine. So if you want true Magic beans, you can stop by my place for a few seeds. In trade, I would consider a cow. p(blue). Culinate editor's note: This post also appeared on Linda Ziedrich's blog, A Gardener's Table.